At the end of last year I was approached by someone from London regarding a family photo shoot for him and his family, which would be his gift for his parents 60th wedding anniversary. The family photo shoot was booked in for the end of January, so I was ridiculously relieved to have woken up to such a beautiful day! With the family not being local, bad weather would have meant we had to settle for an indoor photo shoot, which would have been a real shame. Only speaking to people via email always leaves me a little apprehensive as I never quite know what to expect, but this family was a real joy to work with – they were a very friendly and happy bunch and the kids were good fun too! 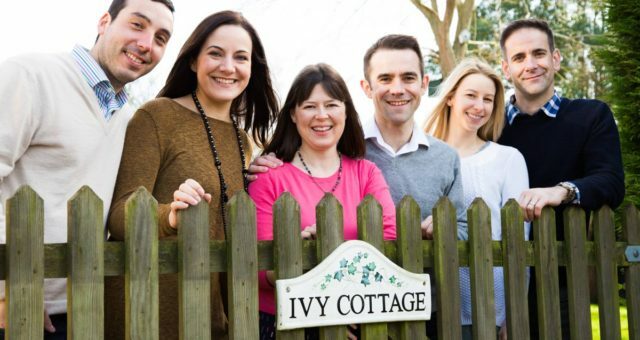 The family had rented a lovely cottage in Bredon’s Norton to house the 10 of them for the weekend. The photo shoot started in the house. With the family being ten strong, when I was setting up my equipment it felt like new people were constantly popping out of the living room area! They were a lovely bunch and gave me lots of biscuit and tea offers, which will always earn you brownie points! The indoor pictures were a slight struggle, as the young boy struggled not to blink when the flash was in use – thankfully it was lovely and bright outside, so as soon as the photo shoot progressed outdoors, this was no longer an issue. The garden gate proved to be a great place for a family photo shot. There was plenty of room to get the whole family in, and the cottage name on the gate, coupled with the cottage itself in the background provided the perfect little mommento image. Thankfully the cottage was on a quiet road that runs through the village, as I had to stand in the middle of it to get the shot! To the side of the garden I spotted some quirky painted metal chairs, we moved these into the middle of the garden, which created a lovely area for some couples pictures. There are a small selection of images from this shoot in the portfolio section of the site, if you’d like to take a look. The children were lovely, but as always with children, it was quite a challenge to get them both looking at the camera at the same time. Instead of using the classic ‘cheeeese’ to get the children looking at the camera, this family has adapted to ‘cheesy biscuits’ – this is certainly something that I will use for future photo shoots.